Shortly before your Lodgit Desk license expires, you will receive an email informing you that you need to renew your license. How do you renew your Lodgit Desk license in its current form? 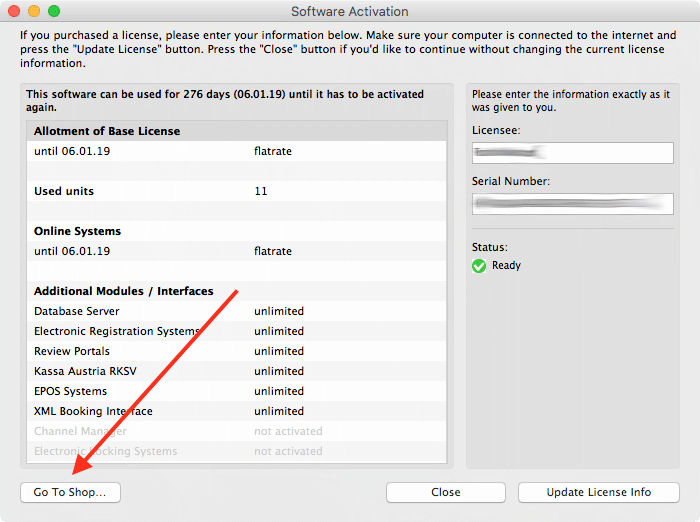 Open the Software Activation window via File> Software Activation. Click on the button "Go to Shop" at the bottom left. Now our shop opens in your browser. Here you only have to select the base license (10, 20 or more rental units) and term (1, 2 or 5 years) and click on "Select". In the next steps you only have to confirm the data and additional modules already recorded for you. After selecting your desired payment method and confirming the general terms of contract and any additional agreements for the online booking engine or the channel manager interface, you purchase your new license by clicking on the "Order" button. The confirmation email of your new license is usually in your inbox a few seconds later.